Pokhara—Prime Minister KP Sharma Oli said that the constitution could be amended as per the requirements as it is not a mythology but is a dynamic document. Addressing a assembly meeting of Province 2 today, PM Oli vowed that the government is ready to amend it if there is any discrimination among people and communities. He also asked for cooperation with Province 2 as according to him the federal government could not be discriminatory to its people. Meanwhile PM Oli promised full support for the development of that province. Oli also said that he would carry out more development works in Province 2 even for proof and show up. Oli also claimed that he is committed for the development of Tarai and some 70 percent of national budget has been allocated for this region. PM Oli also claimed that the Postal road of Tarai would be built within the period of five years and according to him, people can run in this road during the time of another national election. 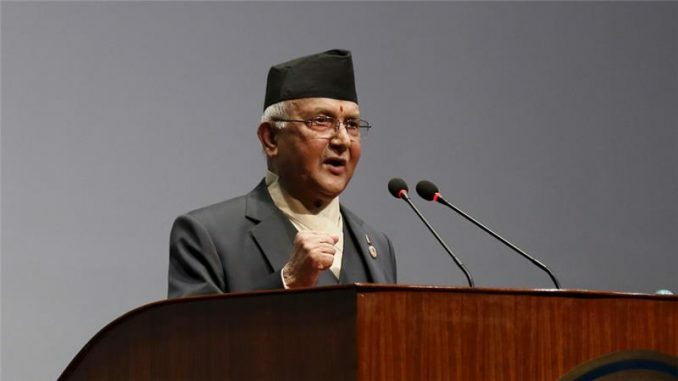 Speaking about citizenship certificate, PM Oli said that everybody would get citizenship if he has got a citizenship certificate of one either mother or father. He also said that the Province 2 is very lucky and the three means of transportation- bus, rail and ship would connect this province first. According to his claim the first vessel would be plied from Province 2 to Kolkata of India. Recalling that he was tried to present as a joker when he talked about Nepali flagship watercraft during his debut premiership, PM Oli vowed that he anyhow would use waterways from Nepal to India in his tenure.